Strollers make traveling with a baby or even toddler a little bit easier. For those who have triplets or even multiples of children having a stroller that can seat all children is extremely ideal for larger families. Some of the strollers on our list can even six up to six children. While these strollers are a little bit on the larger side and look heavier than a stroller that can sit one or two, they are all easy to transport and can fold up nicely in an SUV or smaller van. We reviewed and came up with a best list of strollers for multiples that 2019 has to offer in the market today. For this update we added one new stroller for multiples to our top ten list. We made sure that every stroller on our list still had the highest rating. We also added a bit more information in our criteria section regarding the methods of how we chose our top ten list and what features we looked at specifically when choosing the perfect strollers. For any other questions that you may need answers too regarding strollers for families with multiples please check out our FAQ. Some buyers that purchased these wonderful strollers used them for their at-home daycare or babysitting businesses. They loved having such a fun ride for the kids that they could use around the yard and in the neighborhood. The Angeles Infant Toddler SureStop Folding Bye-Bye Stroller suits children six-months-old and older and accommodates up to four kids. Whether you have a nursery, daycare, or multiple babies yourself, this superb stroller will be loads of fun for the kids and you when you take them for an enjoyable outing. The tires are capable of all terrains, and the seats are padded, reclining, and comfortable. It comes with a three-year warranty and some assembly is required. This terrific stroller has roomy storage compartments, canopies that are detachable, and a seat weight limit of forty pounds. It folds for storage in just three simple steps and includes a brake system with comfort grip and no-roll safety technology. The sturdy steel frame is tubular and lightweight for easy navigation and steering, plus the fabric is fade-resistant, water-repellant, and simple to clean. The tires are capable of all terrains, and the seats are padded, reclining, and comfortable. Prices just under the average cost for these strollers, this folding product is valued for its comfortable seats, detachable canopies, and sturdy frame that is plenty strong for four small children. The Joovy Big Caboose Graphite Stand on Triple Stroller includes two seats in the front for kids six-months-old or older that weight up to forty pounds. Car seat adapters can be used also for newborns and older in these spaces. A bench seat in the rear of the stroller will fit a child that weighs up to forty-five pounds and that is over two-years-old. Perfect for triplets or three individuals, this stroller fits three babies up to 125 pounds. Perfect for twins, triplets, or three little ones with a combined weight under 125 pounds, this ideal stroller folds up easily and neatly for transport and storage. Made of polyester material, it has adjustable footrests, adapters for car seats, and child trays. Various ages of kids can ride in this stroller because it is so roomy. A larger child can sit in the back, while two smaller children ride in the two front smaller seats with the removable canopies. This stroller is large, but it does not weigh very much. It is just a bit more than thirty pounds in weight making it possible for moms as well as dads to lift it by themselves. This item has the lowest cost of all strollers listed. It will suit up to three children of the same or various ages, has reclining seats, a storage section, and folds easily for transport. Offered in two colors choices with seating for three kids, the Foundations Trip Sport Tandem Stroller will fit well through standard doorways and is easy to control. The first and last seats recline, and the height of the seat positions can be adjusted to three different settings. This stroller holds little ones under forty pounds. Additionally, the cup holder on the back handle may seem like a small detail not worth mentioning but try telling that to the mom or dad who likes to have their nice cool soda or a hot cup of coffee as they stroll with the kids. Children must weigh less than forty pounds each to ride, and each seat has its own canopy for shading. It includes a five-point safety harness, and the durable frame is lightweight for quick and easy storage and folding. Little ones will be very safe in this stroller because of the compact design and the safety harnesses. They will not be able to get out on their own once they are buckled in for the ride. There is a storage compartment in the rear of the stroller and a cup holder on the handle for the adult. The seats are cushioned well, soft, and comfortable, and the front safety guard is soft and cushiony also. The cup holder on the back handle may seem like a small detail not worth mentioning but try telling that to the mom or dad who likes to have their nice cool soda or a hot cup of coffee as they stroll with the kids. Priced lower than the average cost, this Foundations stroller has comfortably cushioned seats with canopies for each, a cup holder for the adult, and a storage space in the back. This multiple stroller is perfect for anyone with a set of three. It has many features that make traveling easier with multiples. This triplet stroller is well-made and features adjustable seating. We love this stroller because it is perfect for anyone who has triplets or in need of a bigger stroller for their children. 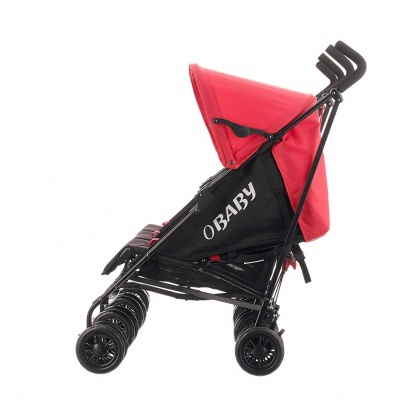 The front wheels have suspension and it does come with a rain cover as well to protect your little ones on those hot sunny or those cold rainy days. This stroller is perfect if you’re looking for something to make your outings a little bit more enjoyable while also having something a little stylish as well. We love that it’s easy to travel with, easy to clean and love the adjustable features on it as well. It’s the perfect stroller for any family who has multiplesThe umbrella that it comes with folds, which will make outings a little less hectic for parents as well. It also comes with foam handles and the leg of the stroller adjusts to yours or your littles comfortable. The fabric material of these seats is extremely easy to clean so parents won’t have to worry or deal with a hassle if a stain were to appear. It also has a removable hood and some places where you can clip other belongings right into place so that you don’t need to carry them, and your hands can be free for a little while. An average price point for above average quality, this stroller makes everything from your weekly trip to the grocery store to hundredth visit to Grandma and Grandpa's a little easier. And with three little ones to wrangle, anything that can bring a little order to your daily routine is a winner in our book! Providing seating for four small children that weight less than forty pounds each, this superb stroller is easy to control and maneuver. When the handle is released, the brake system is engaged for safety and there are canopies included to cover all of the seats well. Transport and storage of the Child Craft Sport Multi-Child Quad Stroller are easy and quick because it folds well. Holding four kids, this amazing stroller can handle multiple terrains safely. 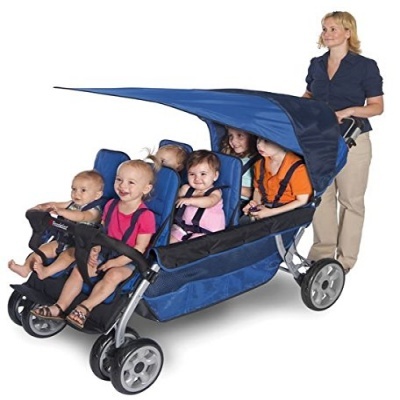 This ideal stroller has stadium seating, so the back kids can see over the heads of the front kids. It features a durable construction and high-quality materials, plus the wheels are durable, shock absorbing, and tough. This fabulous stroller can take multiple terrains and ground surfaces and has a front grip safety bar for the front kids that is soft. The seats are comfortable, reclining, and padded, and there is a large storage area underneath and in the back. The handles are well-padded with foam material, and the seats have five-point safety harnesses. In only a few simple steps, this terrific stroller folds and packs neatly into a van or SUV for easy transport. Any adult can handle it on their own, load up the kids, and go for a stroll. With a below-average cost, this stroller from child Craft is great because it has seats for four kids with canopies, plenty of storage space, and padded handles and grip bars front and back. The Regette Passenger Stroller has seats for six children of the same or various ages and folds easily for transport and storage. It is quite long when folded, so a large vehicle is needed to carry it. This amazing stroller includes a SafeBrake system in the handle, and when the stroller is parked a foot brake can be secured too. It provides easy transportation at one time for as many as six kids, and each seat will hold a less than a six-month-old child or one that weighs less than fifty pounds. The seats are reclining and have five-point safety harnesses. This product features one large canopy that shades all six seats and plenty of foot and leg room for all seats. Safety is built right into this product with the foot brake, handbrake, and safety harnesses in the seats. Kids will have a trouble-free ride in this lovely stroller for six. There are side guard rails that are soft and wheels that are large, strong, and durable. The seats recline and there is a big storage section in the back. The fabric is easy to keep clean. This outstanding item is a necessity for large families, daycare facilities, nurseries, and babysitters. Priced above the above for such items, this wonderful stroller is accommodating to six kids, has plenty of space in the comfortable seats, and includes a safety brake and safety harnesses. The 6-passenger Folding Stroller accommodates six small children and includes canopies for all seats and a huge storage compartment. It has a soft safety grip bar in the front and a comfortable soft handle in the back for the adult. The tires can handle multiple terrains, and the fabric is fade-resistant and water-repellent. When a stroller can seat six children, you can rightly call it a mini-bus. The several safety features are necessary and needed for such a crowd of little people. The sturdy steel frame is lightweight and tubular and packs away in three simple steps. This ideal stroller for six has a grip brake in the handle, plus extra safety is provided with the foot pedal that locks. The seats are padded, comfortable, and reclining, and the canopies are detachable. The seat weight limit for this stroller is forty pounds and six-months in age, plus it includes a three-year warranty. 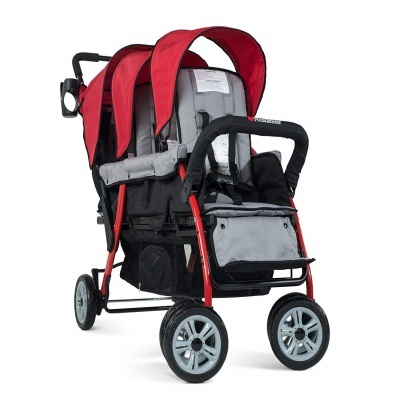 The canopies come off of this fabulous stroller to be suitable to multiple environments. In shady parks or at home, you will not need it, but on sunny days at the playground, you will. With detachable canopies, this stroller is easy to use and even easier to fold up and store.It also provides a three year warranty. This amazing stroller is priced above the average but is a great bargain when you consider that it is a stroller for six kids. It has the terrific features of several braking components and comfy reclining seats. Promoting a spirit of adventure in children and seating four kids is the Foundations Gaggle 4 Multi-Passenger Buggy Stroller. The handle is wrapped in foam for comfort, and the design is easy to navigate and steer. The seats are contoured and have a high back with a head support for each, and the tires are durable and rugged. Holding four little ones, this stroller has a myriad of features including ergonomic brakes and handles, second tier stadium seats, slip-resistant seats and easy to clean materials. The slip-resistant seats are generous in size and will hold as much as fifty pounds. The Foundations Gaggle will fit through commercial doorways ideal for classrooms, and the tires are polyurethane and do not need inflating. Roofs for this buggy can be purchased separately if desired. There are strong harnesses for each seat of this buggy to keep kids safe. Just strap them in for peace of mind. This security measure is better than just seat belts because it holds the top of the child in too. 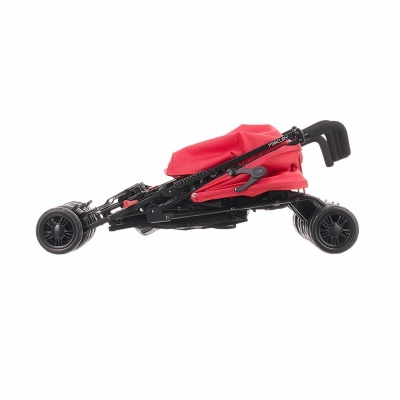 The buggy can roll over and on many different ground surfaces and has ample spaces for feet and legs. The edges of seats are rounded to protect the legs. The second tier of seats is slightly elevated, so the kids in them can see over the heads of the two below. Featuring a parking brake that will keep the stroller in place and secure it, this wonderful stroller is super strong and impact-resistant. The brakes and handles have an ergonomic style to decrease the strain of adults, and the construction is double-walled and durable. This terrific product will not corrode, fade, crack, or chip and can be easily cleaned with water and soap. It has an integrated powder-coated solid steel frame that is long-lasting. Comfort was built into this cute stroller for both the passengers and the adult pushing. The handles are wrapped in soft foam and the seating area has ample leg and foot room, plus headrests. Costing more than the average of these multiple-child strollers, the Foundations Gaggle has the qualities of multiple seating with harnesses, a tough build, and brakes for safety. 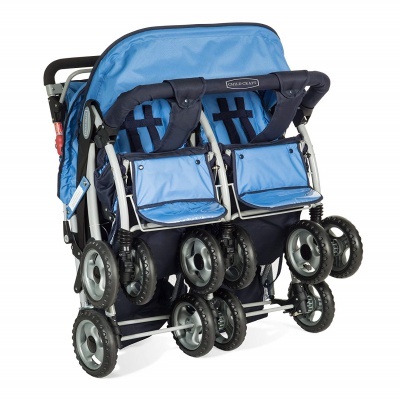 The 6-Seater Never Flat Buggy is easy to navigate and push even if it is on a gravel surface area. The tires have been tested for one million constant revolutions without any wear on the tires, and the front wheels will pivot 360 degrees for best maneuvering. This adorable buggy is perfect for those families with six many kids, or neighbors that love to watch each other’s children and go to the park. It is a splendid way to transports many little kids. Paired seats are elevated slightly with each tier towards the back, so the kids in the back can see over the heads of the ones in front. It is a bright red color with red and black wheels, and the seats have striped red and white seat covers that can be cleaned easily. Each seat tier has plenty of leg room and foot space for the kids. This buggy never folds up, so it is great for nurseries, preschool, daycare, babysitters, and those with more than three kids at home. Get active with this stroller! It can survive six kids and its wheels are durable, so it can handle gravel and dirt services. 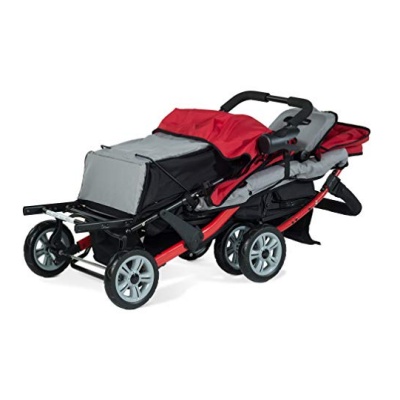 The beauty of this great buggy is that it is easy to roll and navigate form. The wheels are so big, strong, and durable that it can be rolled anywhere you want to go. Even gravel or dirt surfaces will not be a problem. This grand product comes with a three-year guarantee and warranty on the item, plus it is made in the USA. Not much assembly is required upon receiving it, and each seat can accommodate as much as forty pounds. A separate infant seat can be purchased separately to fit this buggy, and a canopy for two seats can be bought separately as well. Because this buggy seats six children and it is a hard durable plastic product, it is the most expensive item we list. It is valued for its sturdy design, many seats, and ease in using it. 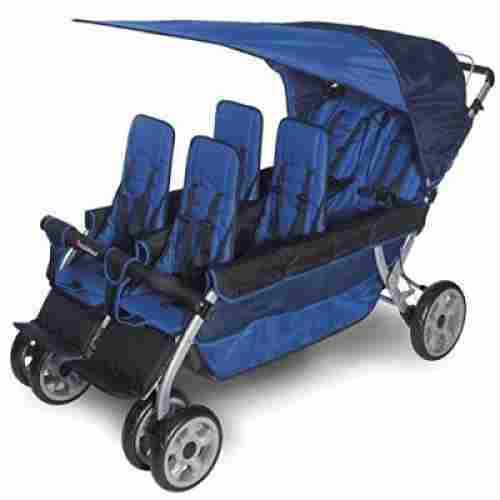 Thee wonderful strollers will seat at least three babies with some of them accommodating four and six children also. The ones that fit more than three kids can be used by a lesser number of children safely. All of the seats do not need to be occupied for the stroller to be used properly. For the strollers that fold up for transport or storage, their compact size is obtained usually with just a few simple steps. Any size of an adult could handle these strollers because they are surprisingly lightweight despite their larger size. Since they are long when folded, a large vehicle will be needed for transporting them, such as a small van or SUV. 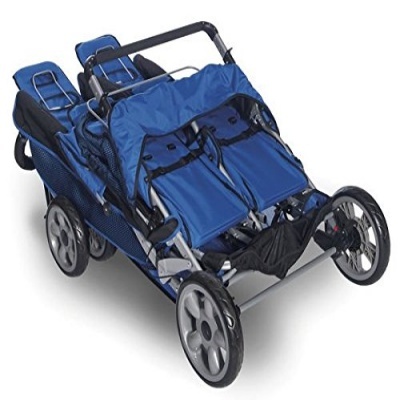 Made out of sturdy materials of steel frames, hard plastics, and tough polyester fabrics, these strollers can take much wear and tear from everyday use. If you have a large family of young children or watch kids for a living in your home or at a facility, then you will need one of these strollers for every day. They will last for years and provide you with a strong dependable mode of transporting your little group to many places effortlessly and comfortably. Many buyers state in their online comments of the strollers they purchased that the strollers are reliable and trustworthy. The price range of these triplet strollers varies greatly in price because they fit different numbers of children. Some are for three, four, or six children, so of course, the prices will be quite varied. We will state whether the stroller is average, below average, or above average in price. 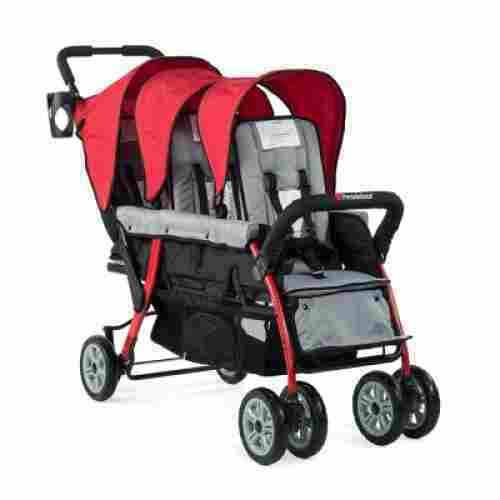 We only select the highest rated and reviewed strollers. 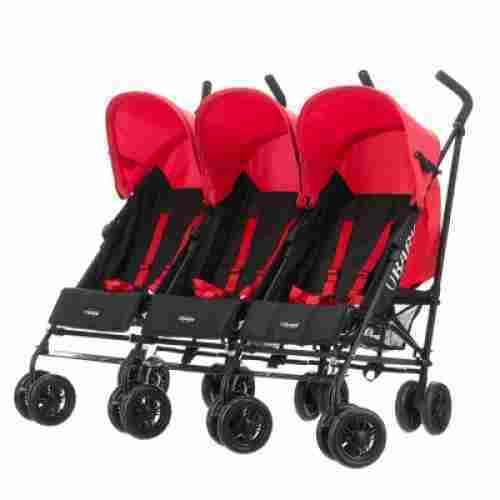 Only the best strollers online rated by customers have made this best list of triplet strollers. They have the most reviews and the best ratings of all online offerings from manufacturers. 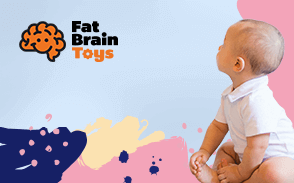 By selecting only the best products of a category and putting them all together in one information-packed buying guide, we enhance your shopping experience and save you time in finding that perfect stroller for you and your family. Our concise and useful summary sections tell you all of the details from the manufacturer’s product descriptions and customer feedback. You know instantly what is terrific about each item and what people did not like the most when they purchased theirs. All of these strollers and buggies are easy to clean. From broken crackers to vomit, simply wiping off the material with a wipe or throwing some of the covers in the washing machine can keep your buggies clean and your kids happy. 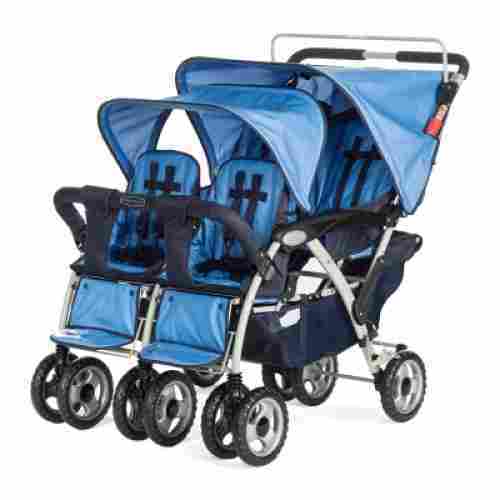 Only the best strollers online rated by customers have made this best list of triplet strollers. They have the most reviews and the best ratings of all online offerings from manufacturers. By selecting only the best products of a category and putting them all together in one information-packed buying guide, we enhance your shopping experience and save you time in finding that perfect stroller for you and your family. Our concise and useful summary sections tell you all of the details from the manufacturer’s product descriptions and customer feedback. You know instantly what is terrific about each item and what people did not like the most when they purchased theirs. q: Can you safely use a four- or six-seat stroller for just three kids? Yes, you can put fewer children in these strollers than there are seats. The extra space can be used for storing the essentials for walks and rides, such as snacks, water, diapers, toys, and extra clothing. q: Can different ages of kids fit in these strollers or does it have to be triplets or quadruplets? Yes, as long as the weight limits are followed, various ages and sizes of children can be placed in these strollers. This makes them ideal for nurseries, daycares, pre-schools, babysitters, and large families. q: Are these hard to manage for a woman? No, these strollers can be handled by even small women with an average strength to steer, navigate, load, unload, fold, unfold, and pack these into the vehicle. They are unusually lightweight for their size and accommodating features of holding several small children. The length of the folded strollers is the only concern for some buyers as they can be longer than some would expect in the folded form. Steering them is easy because of the durable large wheels and the great turning abilities. q: Would these turn over easily being there are so many kids in these strollers? No, we have not seen any comments from online customers about the strollers turning over or being dangerous to this effect in any way. The strollers are wide enough to not be a hazard of tipping even with the many little bodies in them. As you will notice on each of them, the wheels have been placed far apart to prevent this from happening. q: Do they all have safety harnesses to keep the children in the seats? Yes, every one of the listed strollers has a safety feature to keep the children secured inside. The harnesses hold in the bodies well and are the best way to keep the little ones in the stroller. A few of the strollers have seatbelts, which are not as constrictive for the child. these can be simply unbuckled by the child as they learn from watching the adult take them off. Harnesses, however, are more involved in putting on and getting off for the very good reason for extra safety. q: Are these easy to clean and care for? Yes, these are easy to clean since they are made of hard plastics or sturdy polyester material. Most of the cleaning will just take some soap and water to spot clean.